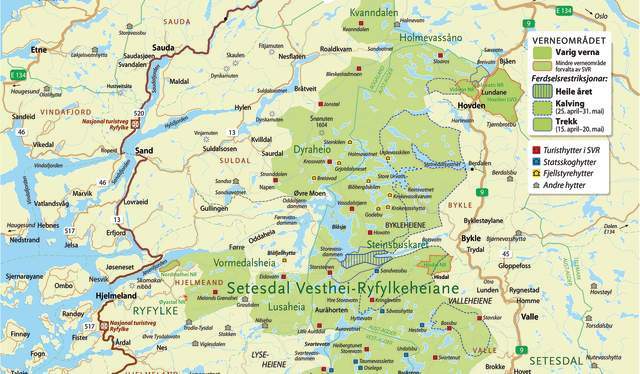 The vast mountain areas between Setesdal and Ryfylke constitute a part of the Setesdal Vesthei – Ryfylkeheiane. The 6154 km2 area is the second largest wild reindeer habitat in Norway and home to the southernmost population in Europe of these animals. 50 percent of this area is protected to preserve a continuous mountain area with its fauna and flora, summer mountain farms and other cultural treasures. 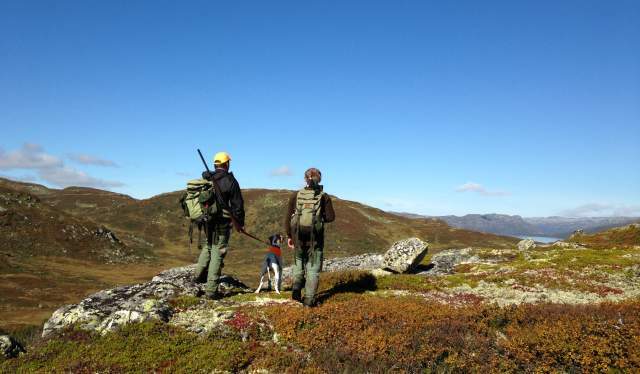 The most important aspect, however, it to preserve important sections of the wild reindeer habitat. The preservation of the wild reindeer population is extremely important, and this is frequently the main reason for establishing nature protection areas. These surroundings often serve as winter grazing land, migration routes and calving areas. 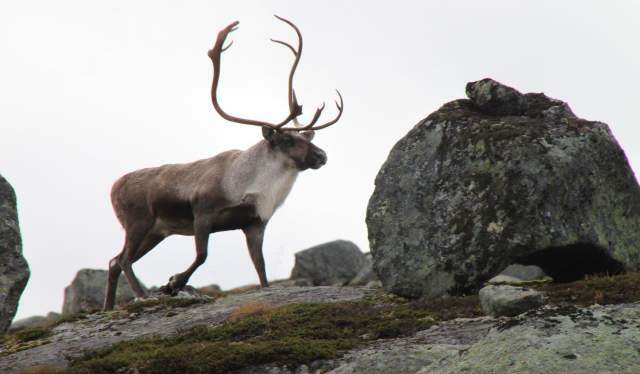 The management of them is therefore crucial for the future of the wild reindeer, and the protected areas are vital in the national wildlife preservation plan. Setesdal Vesthei – Ryfylkeheiane is also a mountain area in regular use. Written sources from the last 200 years provide an historical account of this, and archaeological findings reveal that this use can be traced a long way back in time. This extensive utilization of the area has left its physical marks on the landscape and formed the attitude and mentality of the local population in this part of Norway. Not least with regard to recreation and experiences of nature, this unique landscape is worthy of preservation. For traditional outdoor life the wildlife conservation has practically no impact. With certain exceptions you may go wherever you want to. You may set up a tent, go hunting and fishing, gather berries and mushroom. For hunting and fishing, prevailing laws and regulations must be observed; and you need a permit from the landowner. The public right of access prevails, and there are several marked trails and tourist cabins in the area. The local branch of the Norwegian Trekking Association (DNT Sør and Stavanger Turistforening) has a number of cabins in the Setesdal Vesthei – Ryfylkeheiane. The Steinbuskaret pass in Bykle has a year-round restriction of access. Otherwise there are some areas, for example at Hovden, Valle and by the Brokke–Suleskard road, which has restricted access in April and May. We advise you to obtain information about this before you start your hike. Wildlife, including birds nests and den areas, is protected by law. Hunting and fishing is permitted in accordance with prevailing regulations. Fishing with live bait (fish) is forbidden. You are allowed to pick berries and mushrooms. Vegetation, including dead trees and shrubs, is protected by law. Introduction of new plant and animal species is forbidden. Any activity which may alter the natural conditions is forbidden. • Use your binoculars frequently. • If you encounter wild reindeer, return cautiously the way you came. • Try to avoid being in the wind direction towards the animals. They have a good sense of smell. • Bring your dog along if you like, but keep it on a leash. • If you risk disturbing the reindeer by taking a photo, you should rather buy a postcard. The major part of the nature protection area is privately owned, and there may be long hunting traditions. For this reason some of the tourist cabins have limited access during the reindeer hunt. We advise you to obtain information about this before you start your hike. Please contact DNT Sør or Stavanger Turistforening. Show general consideration when hiking during the hunting season, and avoid unnecessary disturbances. In the Upper Setesdal mountain lakes you have every chance to catch some nice trout. Some of the lakes are situated close to the road, whereas others require a long hike before you may throw your bait. Most fishing permits may be purchased via SMS (only valid for Norwegian addresses). They are also sold at service stations, various stores and tourist information offices.